The temple has existed since the Chinese colonization of Tang, as evidenced by a stele built in 1883 in the reign of King Tu Duc. Despite its modest size, the place was sacred from the beginning. Several other renovations were subsequently completed, including the largest in 1902. The place of worship today extends over 2,000m2, surrounded by a laterite wall two meters high. Following the precepts of traditional Vietnamese architecture, it lies on a North-South axis and its main gate faces Mount Tan Viên in Ba Vi district. The main gate consists of three wooden columns, which rest on a large laterite foundation. Just next to it are two towers facing each other, enclosing a bell and a drum. Their octagonal roofs recall the Khuê Van Cac pavilion at the Temple of Literature in Hanoi. 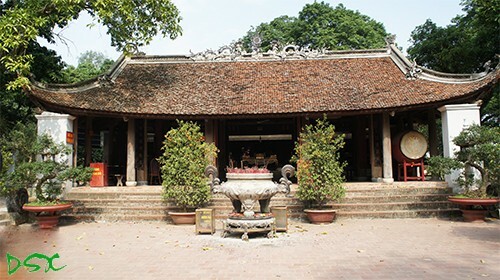 The courtyard in front of the temple is subtly decorated with five bats surrounding a round window, a sign of happiness. Phùng Minh Sơn explains: "Our temple is the main place of worship dedicated to Saint Tan Vien. The Upper, Lower, and Central Temple are supplementary. Và temple also worships the mother goddesses and three deities of Mount Tan Viên and many other Taoist deities. " The autumn temple festival includes a ceremony in which 99 large white fish are caught in the Tich River are dedicated as offerings to Saint Tan Vien. The fish offering comes from an ancient legend that when he was teaching the villagers to fish, Saint Tan Vien caught 100 fish, including a pregnant female Clarias, who was released in a spirit of charity. That fish had nine baby fish who later turned to stone and headed to Va temple to thank Tan Vien. During the holidays, the temple welcomes visitors from the eight villages of Son Tây and Vinh Phuc and from all over Vietnam. Nguyen Thi Binh, a resident of Son Tây, says: "I never miss the two festivals of the temple. I really like its quiet and serene atmosphere. Tourists come here not just because of the fame of the temple, but to enjoy its architecture and magnificent view. "